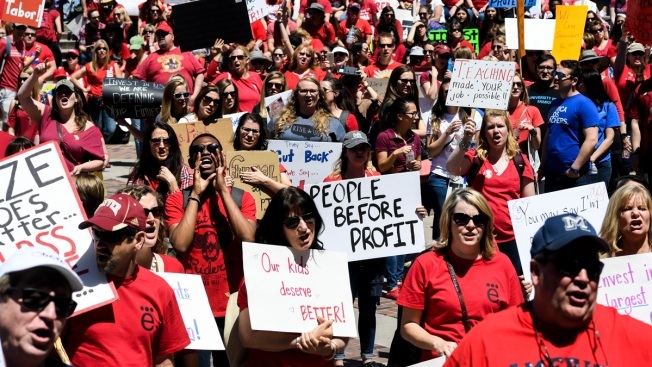 In this April 27, 2018, file photo, thousands of Colorado teachers wear red as they chant during a teachers rally for more educational funding at the Colorado State Capitol. Denver teachers voted overwhelmingly Tuesday in favor of going on strike after more than a year of negotiations over base pay. Rob Gould, lead negotiator for the Denver Classroom Teachers' Association, said 93 percent of unionized teachers voted in favor of a strike. The union represents 5,635 educators in the Denver Public School system, which could see a strike as soon as Monday. The Pueblo school district had merely asked for the state's guidance, and the union did not ask for intervention at all. Most of the city's 20 schools were shut down by the weeklong strike, which ended with teachers winning a 2 percent cost-of-living retroactive raise and a 2.5 percent increase in the current school year. A statement from the district acknowledged that its proposed package was not enough, putting the blame on state funding, but urged teachers to compare the proposal to those at other nearby school districts. "We agree with our teachers that this is not enough and we will continue to fight to address the inadequate funding of our education system in Colorado," said Superintendent Susana Cordova.